Pique Macho (or Pique a lo Macho) is actually incredibly easy to cook but, ladies, it will win you big points with the man in your life (if that kind of thing bothers you). The key is to have everything prepared in advance so that you can just chuck it in the pan. I've seen lots of different recipes including the addition of soy sauce and/or beer to make a small sauce. Also some people serve it with halved hard-boiled eggs and green olives to garnish. The recipe originates from Cochabamba and some Cochabambinos are very protective of this dish! This dish is also almost always a good (if expensive) choice in a restaurant as generally the portions are huge - indeed it is said that this is where the "macho" part of the name comes from, i.e. you are "macho" if you can finish a plateful yourself. Boil water for rice and heat oven for French fries. Observing cooking times for each product, put French fries on baking tray in hot oven and then put rice in to cook. I find that cooking the meat, tomatoes etc. takes roughly the same time as cooking white rice. Fry beef and onions in the tiniest amount of oil you can until lightly browned. 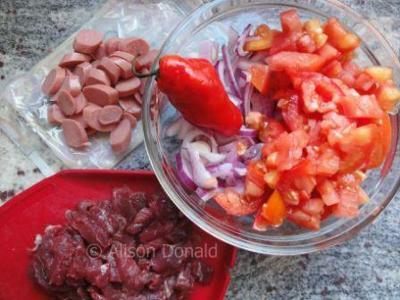 Add frankfurters, locoto and tomatoes, cumin and seasoning to taste. The tomato pieces should be cooked through but retaining their shape. To serve, arrange French fries on plate as the base of the dish. If using rice as well then put rice on half the plate and the fries on the other half. Arrange the meat and onion mixture on the top. I was in the US Navy, on a 3 month deployment to Santa Cruz in the early '90's. One of my favorite memories was going to the different hotels and restaurants around Santa Cruz, Cochabamba and La Paz, sampling local Pique Macho. Bolivian comfort food at its finest! 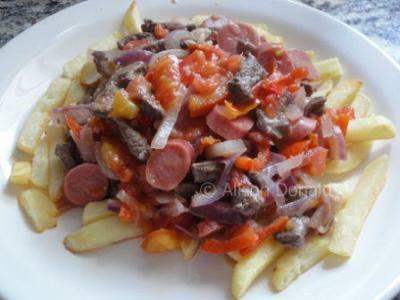 Lomo or lomito (even softer than lomo) is a good choice for this recipe. Generally, use a cut of beef that has no nerves and little fat and is cut transverse to the grain of the meat to ensure a soft beef after cooking. What cuts of Beef here in SCZ do you recommend as best for this recipe.